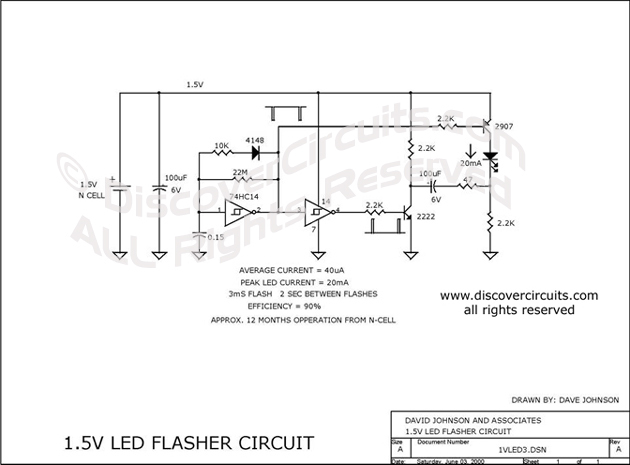 Circuit: 1.5V LED FLASHER VERSION B__ Circuit designed by David A. Johnson, P.E. To squeeze even more energy from a alkaline battery cell, this circuit adds two transistors to a circuit similar to the above design to boost the efficiency. A small 1.5 volt alkaline N cell should flash the LED for a full year. It too uses a "charge pump" technique to provide a LED the needed voltage.